When your customer demands credit and your supplier demands cash, you might need more than standard factoring provides. 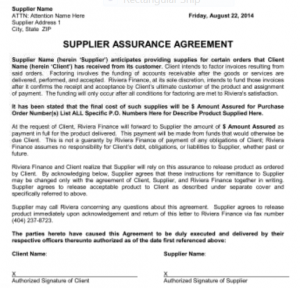 A supplier assurance letter, written by Riviera Finance on your behalf, can convince your supplier to sell you the materials you need ON CREDIT, long enough to deliver a finished product to your customer. This transition credit can be a launching pad for your company’s success. A. Your company receives a purchase order for goods from a reputable customer, Able Department Stores. B. Riviera Finance approves Able for factoring. Although the Supplier Assurance isn’t a formal letter of credit on your behalf, it provides transaction security to the supplier, often enough to be a credit substitute and bridge the credit gap for future transactions. Ask your Riviera Finance representative for more information on how a supplier assurance letter can benefit your company.